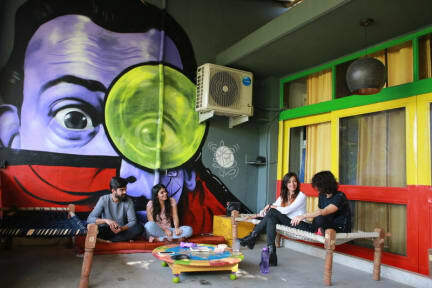 Located in the heart of uptown Delhi (11 Kms from the center), surrounded by lush green gardens, connected with the fastest commuting option available - The Delhi Metro, HOG hostel offers a world into itself. Upon entering the local surroundings one can’t help but notice the impressive and stately House of Gypsy, belying Delhi’s humble beginnings and dominating the scenery around it. The dream to see the world is more powerful and capturing than any other product made or paid for in factories. That’s why we at House of Gypsy, a house for all free folks, is in the business of servicing this great affair of making memories, not trips. This place was my home in Delhi for a few weeks and it will always be my second home for life. I've seen they working on it since the beginning and can't be more proud about how it turned out! The best view, the best people and the cheerfulest vibes are here. Come and see by yourself! The hostel is a nice place and the staff is very attentive.